Getting camp ready is very exciting; I often liken it to a funnel where all the ingredients come together to prepare for opening day when the busses crash on our shores like a tidal wave and then the campers swarm up the hill; and then the counselors wished they paid attention to what we were saying during orientation! 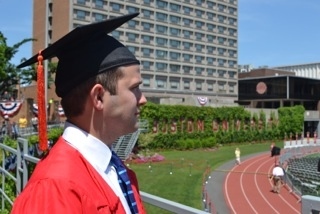 A couple of weeks ago, we briefly left the shores of camp to attend our son, Jared’s graduation, at Boston University; what a milestone; it really hit me. Having this great opportunity to partner with parents and help nurture, impact, influence and guide their kids through their fundamental growth years, to be part of the foundation of who they will become by the time they finish college; this came to fruition for Stephanie and I. A flood of emotions, pride, love and excitement overcame us. Every little thing over the years what we did and said reached its pinnacle as he walked across the stage to receive his diploma. Our little baby boy (he was 18 months old our 1st summer here at Camp Towanda) grew up; he accepted his diploma, turned to us, said thank you and I’m ready for camp! So, I share this chapter in our life that has concluded and eagerly await the coming weeks as our team assembles here at camp to help do the same for our campers. Stephanie and I take the responsibility seriously that is entrusted to us with and look forward to a wonderful summer.